I am absolutely loving the Wheel of the Year ritual kit boxes created by the wonderful witches at pagan shop Wicca Moon, in south London. 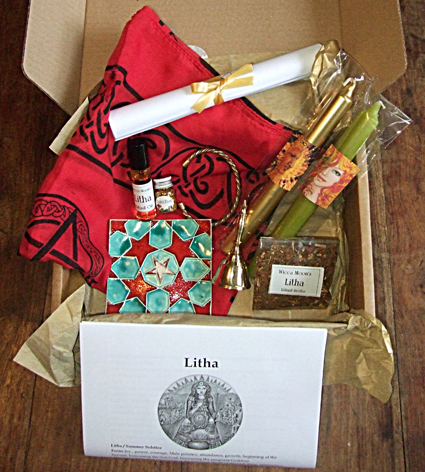 The photo shows the contents of the latest box, for the festival of Litha at the Summer Solstice. My set arrived in the post today and, as always, it was such a wonderful surprise. Each box offers a ritual that is ideal for solitary witches to use to celebrate the season. They also contain beautiful items to use in the rite and build up a superb set of magical tools. You can buy the separate boxes in the series or you can subscribe for the whole year. Wicca Moon also puts videos on its website showing how to use the tools and the ritual being performed, so you can view it before doing the rite yourself. I will also be writing a full review of the kit closer to the Summer Solstice. Wicca Moon is at 50 Well Hall Road, Eltham, London, SE9 6SH. I'm going to check into those boxes. I get a monthly Moon Box which is so much fun and filled with goodies.